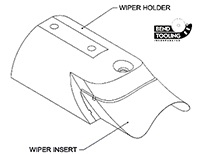 The fixture into which a wiper insert fits to form an inserted wiper assembly. While the wiper insert tends to be a standardized component to ensure low cost and ready availability, the wiper holder — which has relatively long tool life — is customized to suit the particular requirements of machine and set-up. Therefore, the wiper holder can be extremely short to clear collets holding short end-tangents, or extremely long to clear the backside of a small-radius teardrop bend die making a 180-degree bend. Wiper holders can also be half-round (most common) or square-back (to simulate the traditional square-back solid-body wiper).